While a possible shift to an A-series processor in a Mac has been rumored for some time, a new report claims that Intel is certain that it is coming, and soon. According to what is mostly a roundup of recent news on Axios, Intel officials have privately told the venue that they "expect such a move as soon as next year" -- meaning 2020. Cited as further evidence is the report from Wednesday about Apple's "Project Marzipan" potentially being extended in the 2019 WWDC, as well as the debut of the frameworks at the 2018 WWDC. Apple has convinced its devout to shift to new hardware architectures in the Mac itself twice, once with 68000-series to PowerPC processors, and again from PowerPC to Intel. But, it's actually hurdled the potential marketing nightmare of large shifts for users many times. Any ARM shift won't be immediate, and won't span the entire product line in one fell swoop. It will likely start on Apple's low-end, like the MacBook and possibly a Mac mini migration. Additionally, Microsoft has Windows on ARM now, with a 32-bit software compatibility layer, so virtualization or even Windows on top of one of these new machines isn't out of the question -- but isn't likely at launch. Supply chain rumors of a shift started before "Project Marzipan" was unveiled, with industry sources claiming as early as September 2017 that Apple was actively trying to cut back on dependence on Intel in regards to the MacBook or MacBook Pro. The account claimed that Apple was looking to leverage ARM processors, such as the A-series of chips currently found in the iPad and iPhone for future models. Since that original report from the supply chain, Ming-Chi Kuo has chimed in saying that he expects the shift to begin in 2020 or 2021. A "Project Kalamata" has also been discussed, with prototypes of the device from Pegatron said to utilize a touchscreen, SIM card slot, GPS, compass, and a water resistant housing -- suggesting a different form-factor entirely than the MacBook Air or MacBook. At the same time as these rumors erupted, Apple shipped the A11 Bionic processor. That processor has a single-core processor speed of 4205, with a multi-core speed of 10122. The results are very similar in performance to the 2016 and 2017 i7 MacBook Pro for single-core performance, and the multicore performance of the original 15-inch MacBook Pro with Retina Display from 2012. Apple's A12 has been released since, with benchmarks for it on a par with processors used in notebooks and computers, and within striking distance of the best desktop CPUs, depending on workload. Of course it's coming, and likely at this point Apple is already shifting its orders of processors from Intel over the next 2 years as a clear sign to intel. I know this will sound crazy but I predict that Apple WILL NOT position the A-series as the low-end product, but instead position the A-series as the "High End" product categories. I think it is already happening with the price of iPad Pros. I think they will retain exclusive features compared to Intel Chips, maybe these will be performance (just look at the current iPad A-series, faster than what 92% of portable computers), or battery life, or specialized application support, or maybe it will just be a spec advantage, like more Ram or thinner products. Now this could fail, and I could be 100% wrong about how they position the A-series as premium but I find it very hard to believe they would make a transition unless 1. The A-series is better than Intel. and if that is true then why make it a value low-profit product?? Just please give them keyboards that have at least a little key travel. The A-series processor handles SMP a little differently than the Intel does, so that's the basis behind the suspicion about the lower end of the product line that needs more in the way of single-processor computing, versus hammering all the cores simultaneously with one task. "Any ARM shift won't be immediate, and won't span the entire product line in one fell swoop. It will likely start on Apple's low-end, like the MacBook and possibly a Mac mini migration." That's an assumption. When Apple made the shift from PowerPC to Intel, they transitioned their entire Mac line within 1 to 1.5 years. There's no reason to believe they won't do the same when transitioning to ARM. I will only buy a new MacBook once Apple puts in its own chip.There is no reason for a Mac to start at $1200 while better performing iPads are $800. Two years is not a fell swoop. It takes about two years from design to execution, a bit less if an architecture already exists. What it won't be is the entire product line released at once. 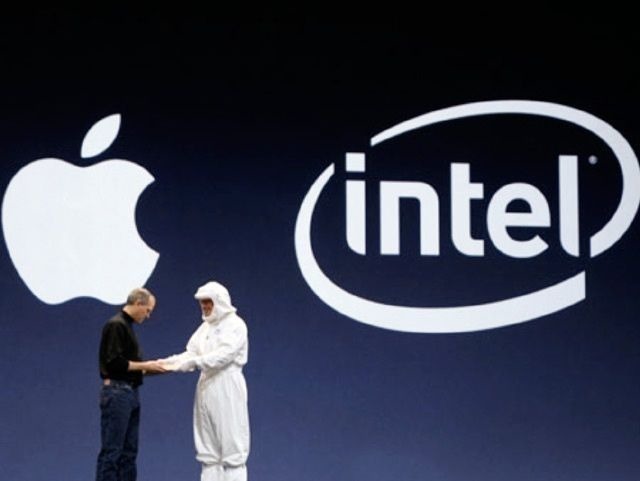 If Apple leaves Intel will they survive? Even their modems will be ditched eventually. Apple has done it before but not a trivial task. Hardware is just one part but how about porting MacOS and applications ? And going forward to keep Apps to support on both platforms. So what if the ARM Macintosh is the modular Mac Pro, running some variant of the iOS device chips? That could explain why Apple has moved so slowly on the Pro desktop. It predicting, just thinking what if. If Apple is shifting to ARM, the WWDC would be the perfect time to announce it. My guess would be that ARM first appears in the MacBook (if it still exists at the time in its present form) and the MacBook Air, with the MacBook Pro and all desktops remaining on Intel for the time being. But don't just think about the main processor itself. Apple now has demonstrated expertise in its graphics processors. Agreed. And if the power is indeed better than the Intel chips, i would expect low volume niche machines like the new Mac Pro to be the test bed for these chips and both prove themselves and scale to consumers via that model. Why are you so adamant about the A-series branding being used in Macs? They don't have the GPU or many other SoC features used in desktop and notebook Macs so why not assume Apple will address this with another ARM-based chip that they designed to meet the needs of their PC line running macOS the same way they designed chips chips for the Apple Watch, AirPods, and controller chips? Isnt this basically an iPad maybe one running a dedicated OS not hamstrung by a phone OS but basically an iPad. Why bother prototyping when the current product would benefit from a more Mac like OS that wouldn’t be suitable for a phone. Yep yep yep yep yep. I can't imagine they would risk upsetting the Mac Pro users with an ARM chip. Yes it's a small percentage of people comparatively but I feel like they might possibly carry the most weight on a per-user basis. I would guess many of them work in a production environment thus influencing a business or team on what the company should be outfitted with for their workflow. IF...and that’s a big IF, they are getting far better performance do you think anyone would get upset? On the contrary, I would imagine people shifting over. But granted, that all the depends on the power of these supposed new chips. But the new iPad Pros are pretty FN good already. That will take a long time. Their own chip... you better read who owns patents on "their" chips. Not Apple for sure. I will give you hint. They also own my current employer firm. I would imagine everyone wants better performance, I just don't see the ARM chips stacking up to something like an 18-core Xeon, or even a multi-cpu configuration. The Pro users typically work in a production environment so stability is everything, I'm not sure that the "typical" applications they are running have the same offerings for the ARM architecture(at least not yet). BS. If it were coming to MacOS then AMD Threadripper and Ryzen would already be here.